An incident of a Gorkha monument vandalised at Sahid Park kalimpong as reported by this newspaper yesterday, found a political stage on Wednesday with the Gorkha Janmukti Morcha (GJM) protesting unlawful activity and demanding instantaneous arrest of the culprits. The monument was destroyed on February 20 reportedly by some unsocial elements according to the report filed by a guard of the park. “We strongly protest the snaffling and stealing of equipments from the park. 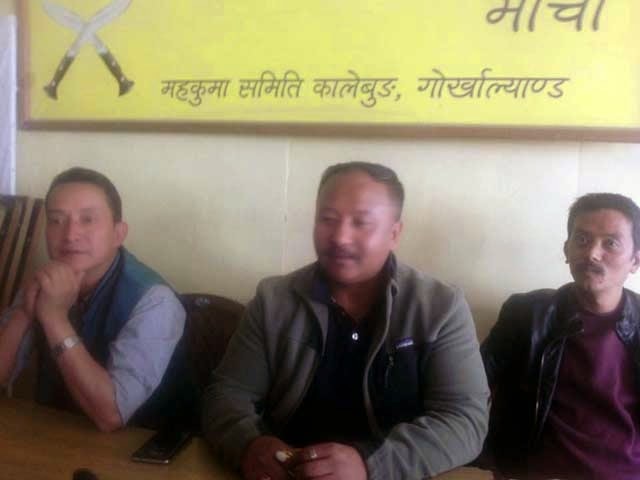 The police should immediately investigate the matter and nab the culprits,” said Binay Ghisingh, the general secretary of the GJM’s young wing here. The youth body amusingly has decided to form a crew to patrol the town from now on to curd such crimes especially during night hours. “We will not forgive anyone if we find such activities from now on,” said Ghisingh. said Bal Krishna Thapa, the press and publicity secretary of the youth body here. The youth front is likely to meet the authorities of the parks and garden wings of the GTA on Thursday. The front will apprise the authorities to add more employees for the security of the Sahid Park. The park was built by the erstwhile Darjeeling Gorkha Hill Council (DGHC) in memory of the martyrs who laid their life during the 28 months bloody agitation for Gorkhaland in 1986. The agitation was lead by Late Subash Ghisingh, the chief of Gorkha National Liberation Front.